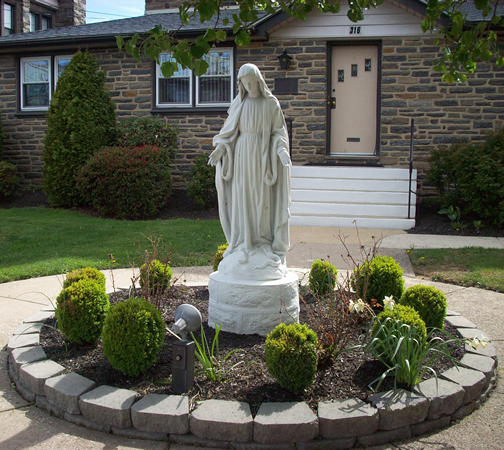 We welcome all Catholics moving into the Willow Grove, PA area to our Parish community. Please call the Rectory at 215-657-0252 to make an appointment to register. You can click this link to download the Parish Registration form in advance of your appointment. Do you know someone who does not have a church family and would like to belong to one, or who is not baptized and desires to be? The Rite of Christian Initiation of Adults is the process into which an individual can enter in order to gain a relational experience with Jesus as well as with the community He joins. 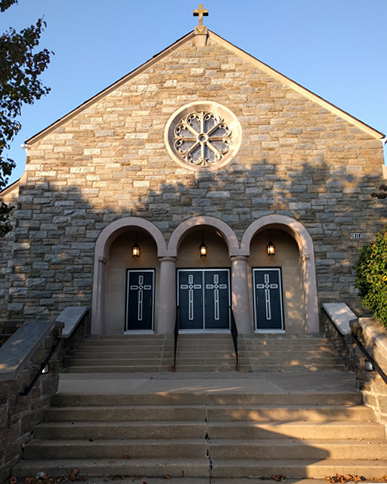 At St. David, RCIA sessions are held on Thursday evenings at 6:45PM-8:15PM in Rectory. 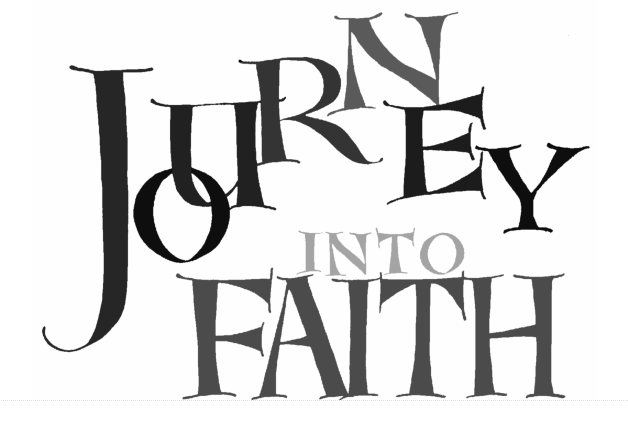 The process is a “come and see” approach to learning about the Catholic Faith. 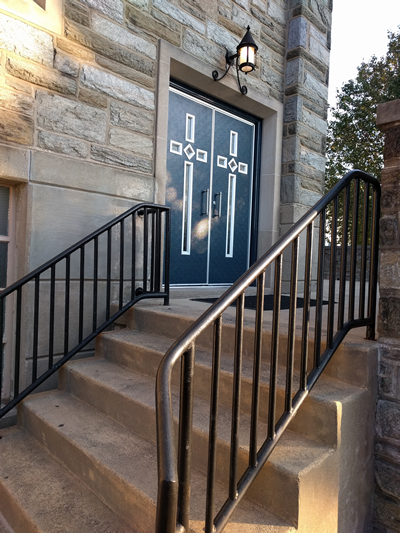 Contact Sister Mary St. Mark or call the Rectory for more information regarding RCIA (215-657-0252) or learn more about the RCIA process. If you haven’t yet, sign up for the free CatholicPhilly newsletter! 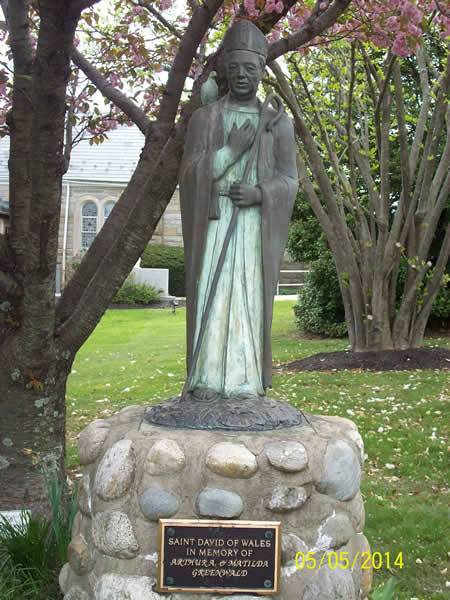 Learn more about St. David of Wales. 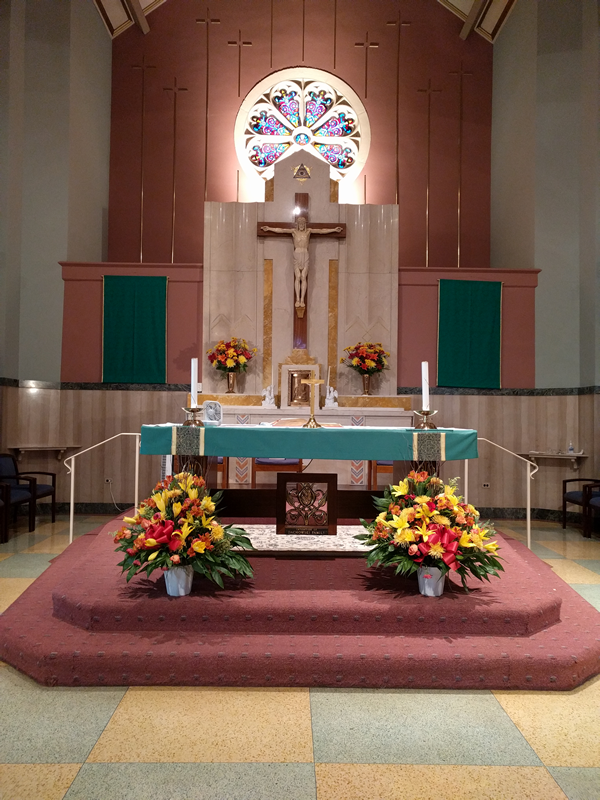 Vigil Mass: Saturday night 4:00 PM. Daily Weekday Mass: 6:30 AM (Chapel), Saturday morning Mass: 9:00 AM. The rectory office is closed on all Saturdays for the transaction of any business except for the administration of the Last Rites as needed any time. Also, any request for keys or letter pick up must be completed by 7:00 PM Monday thru Friday and on Sunday between 10:00 AM and 1:00 PM only. Two factors should motivate the way we dress when coming to Mass: The respect we have for God and the sacred liturgy, and the respect we have for our neighbor who sits near us at Mass. This is an instance when love of God and neighbor are placed before our own comfort. We thank you for your outward display of respect for the real, divine presence of Christ our Lord in the Blessed Sacrament as shown by your respectful attire. This entry was posted in General Information on June 13, 2014 by webadmin. 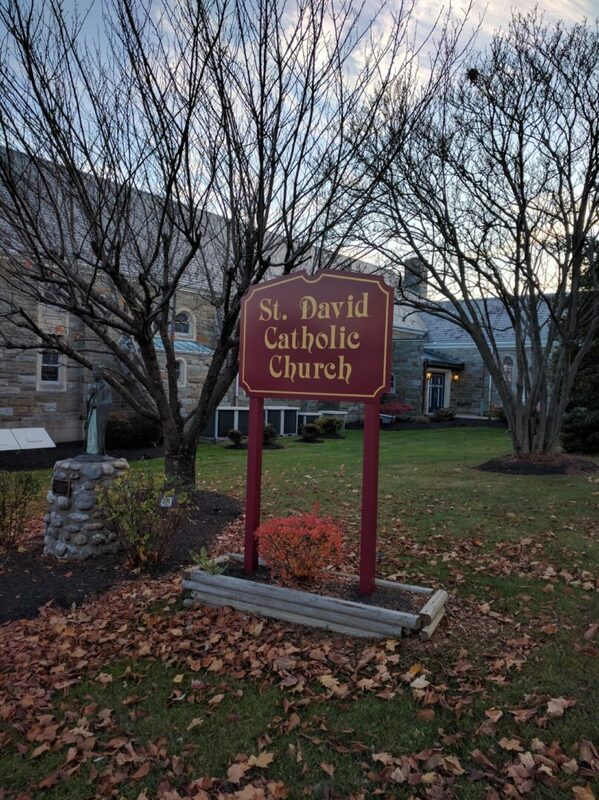 Members of the St. David St. Vincent de Paul conference will be standing at the doors after each Mass on the weekend of April 27th and 28th to ask for your financial assistance for the needy in our parish. All funds will remain in the Willow Grove area. May God bless you for your Christian charity. Retreats address the question: is there balance in my life? While only you can answer that question, a retreat provides the guidance and comfort to help you emerge with a deeper and more profound understanding of God, self and others. St. David’s Men’s Retreat weekend at St Joseph’s in the Hills in Malvern, PA is May 31st, June 1st, and 2nd. For more information on how to join the many men from St. David’s, please call Gary Warnalis at 215-441-0334 or Henry Jacquelin at 215-530-5076. This entry was posted in Uncategorized on April 6, 2019 by webadmin. St. David’s Vacation Bible School Coming Soon! St. David’s Vacation Bible School will be held June 17-21 from 9am-12pm. Art, Music, Gym, Bible, Snack and more. As we begin lent, what better offering than to give an hour of your time each week in Eucharistic Adoration, in which Jesus is truly present, body, blood, soul and divinity in the Blessed Sacrament. We are also in need of at least 2 adorers per hour throughout the day, if another hour is better for you. 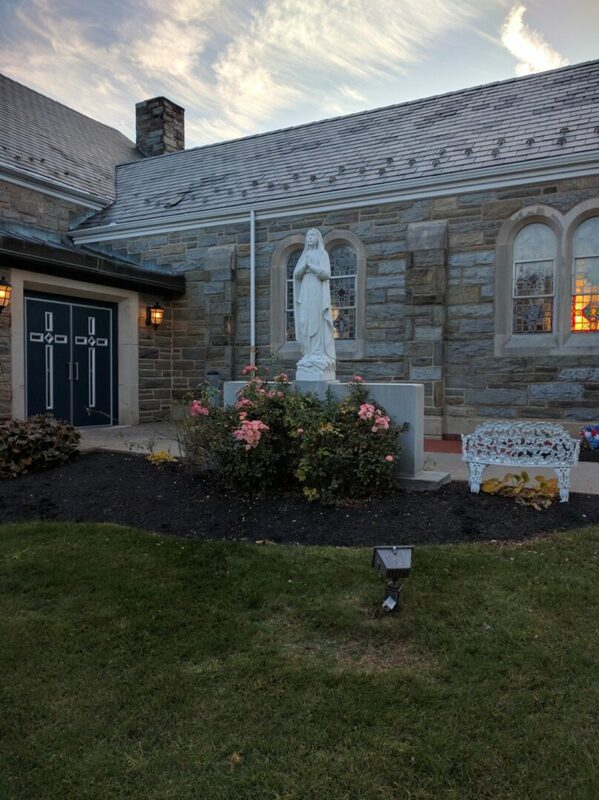 Contact Paula Warnalis at 215-441-0334 if you are available to sign up for a Holy Hour. This entry was posted in Uncategorized on October 21, 2016 by webadmin. The Catholic Church uses the Rite of Christian Initiation for Adults (RCIA) process to welcome new members into full communion with the Catholic Church and to welcome and help young Adults and Adult Catholics who have not received and now desire to receive the sacraments of First Penance, First Eucharist and Confirmation. 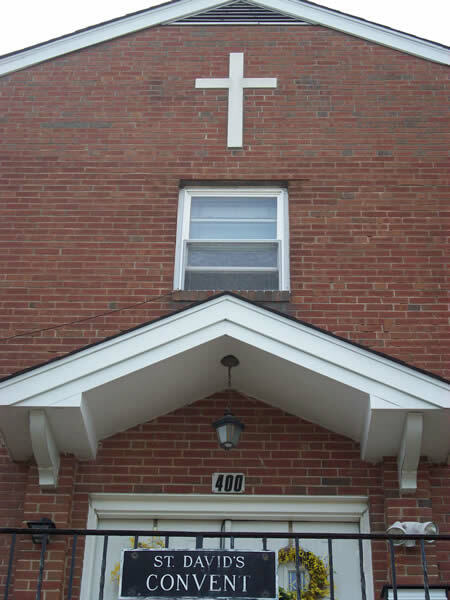 We meet at St. David Parish on Monday evenings from 7:00-8:00PM in the Rectory. 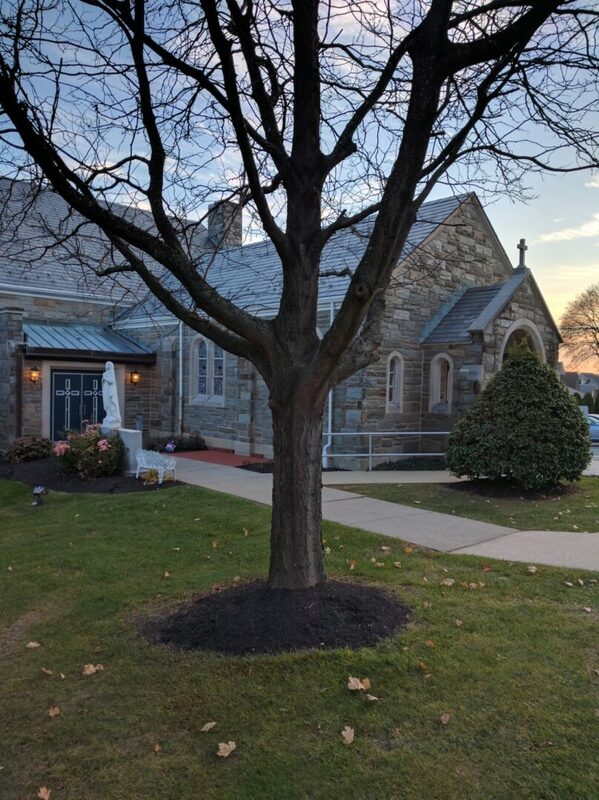 If you feel God is calling you to a deeper relationship with Him, or if you have any questions about the RCIA process please call Father Connors (215) 657-0252 or Sister Mary St. Mark (215) 659-4059 or email marystmark@gmail.com. This entry was posted in Uncategorized on June 24, 2016 by webadmin. Eastern Montgomery Interfaith Food Cupboard located at 1356 Easton Road in Roslyn, is in need of volunteers to work on Fridays 11 AM-1 PM and on Saturdays 9 AM-12 noon. St. David St. Vincent de Paul supports this cupboard. Please call Rebecca 215-287-8558 if you are able to help. Thank you, and God bless you! This entry was posted in Uncategorized on September 8, 2018 by webadmin. Visit QOA Day Open House Date: PreK3-8th grade Wednesday, May 15, 2018 10-11:30 am. Preschool Evening Open House Monday, April 8, 2019 7 pm. Come see all we have to offer 3 & 4 year olds with our full and half day programs! RSVP to Kim O’Doherty at kodoherty@qoaschool.org. you, contact Kim O’Doherty at 215-309-4028 or kodoherty@qoaschool.org to learn more! Please consider supporting the Queen of Angels Regional Catholic School “Choirs of Angels” Annual Fund when making your end of year donations! Go to qoaschool.org and look for our Give Now button. Donations can also be mailed to QOA, Advancement Office, 401 N Easton Road, Willow Grove, PA 19090. For more information, contact our Advancement Office at 215-309-4028. Support QOA while you do your school shopping! Before you make your next purchase from from Amazon, go to smile.amazon.com. Once you register Queen of Angels School, your Amazon account will reflect QOA as your charity selection. This site is exactly the same as amazon.com, and a percentage of your purchase will be designated to our school. Please bookmark the site – smile.amazon.com, so that all of your Amazon purchases benefit our school. 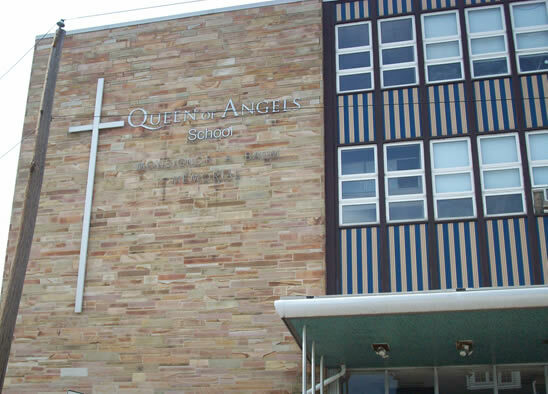 Queen of Angels School provides children with a quality Catholic education that includes all the regular subjects enhanced with art, computer, gym, library, music, and Spanish for all grades. Grades 5- 8 also have an honors math class. The children make regular use of iPads, and Surface tablets to enhance their learning. Our 4th- 8th grade have a 1:1 Tablet Program. The value of our PreK program in terms of quality of education and price surpasses all with -full and half day options for 3 & 4 year-olds. Only a few spots remain in our PreK 4 program so don’t delay registration!!! Before and After Care is available from 7am-6pm! Scholarships! Our 25 eighth grade students have earned over $175,000 dollars so far in academic scholarships to various high schools! Come see first hand all the wonderful things we have to offer for students in grades PreK3-8 during a private tour. Please contact Kim O’Doherty at 215-309-4028 or kodoherty@qoaschool.org to set up a time convenient to you! Looking for a preschool program for your 3 or 4 year old? Is it time to transition your child from daycare? Queen of Angels preschool program surpass es all in terms of value and quality. We offer full and half day programs for your child. Students are introduced to pre-reading, math and handwriting skills while also having religion, small group work and of course lots of fun. Our preschool students also have gym, computers, art, Spanish, library and music class once a week in addition to various class projects. We offer Before Care starting as early as 7am and After Care until 6pm. If you are looking for a place where a love of learning will be fostered in your child in a nurturing and happy environment, Queen of Angels is the place for you. This entry was posted in Queen of Angels School on October 15, 2016 by webadmin. We invite all 8th through 12th grade students to attend any of our events. Come see what we are all about! EPIC is a Roman Catholic ministry program for teens in grades 8 through 12. 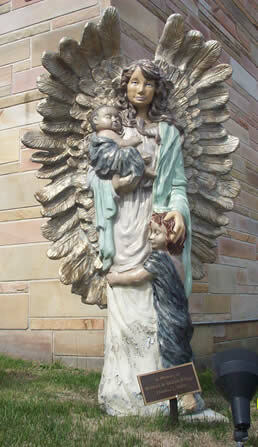 We are supported by St. Luke, St. David, and Our Lady Help of Christians. EPIC strives to make teens excited about their faith, experience the Eucharist more fully and become true Disciples of Christ. By better understanding, “Everything Possible in Christ”, teens will learn to rely on God’s graces when they struggle with all of life’s difficulties. Encourage the teens in your life to attend an EPIC ministry event, social event or service project. June 21-23: Steubenville Youth Conference at Franciscan University, Ohio. This entry was posted in Youth Group on October 21, 2016 by webadmin. The Middle School Youth Group is for boys and girls grades 5-7. This entry was posted in Youth Group on May 13, 2015 by webadmin. Your Scrip Purchase Goes a Long Way! Start buying scrip today to save on next year’s tuition. Scrip is a no-cost way to earn money for catholic school tuition. This includes grade school, high school, and religious education programs. EVERYONE can participate. Even if you’re not a school parent, you can help family members or friends with tuition, or just support parish tuition assistance. Find complete information at http://www.qoaschool.org/scrip-tuition-fundraisingprogram. and on the following Sundays in Father Curran Hall from 10-11:15: April 14 and April 28th. Special orders will be due by noon on March 24th and April 7th. NOTE: No scrip will be sold on Good Friday, April 19th. Feel free to email Sharon cartlidge5@verizon.net or Jen jenniferkoch2010@gmail.com. This entry was posted in General Information on August 19, 2016 by webadmin. 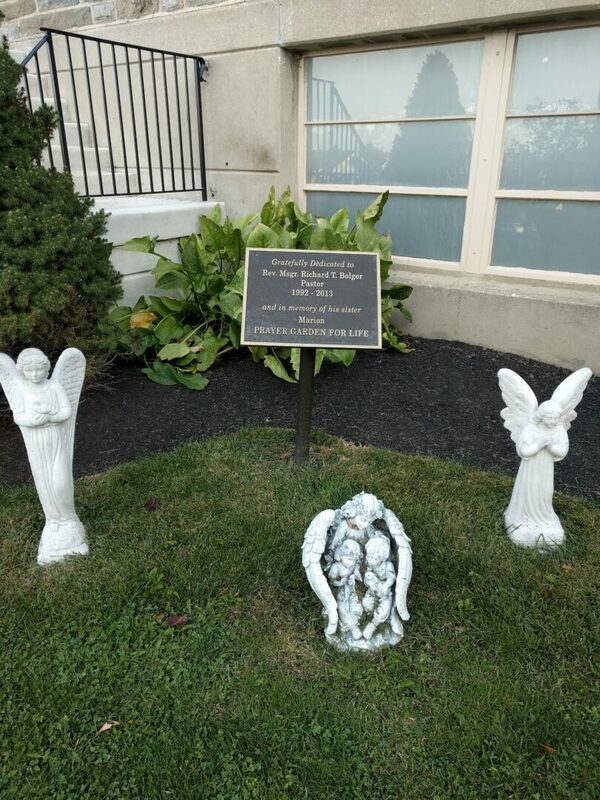 Join us in our prayerful witness to Life in front of Abington Hospital from 2:00PM – 3:00 PM on the 1st Sunday of each month. There are NO scheduled confessions for the Eve of First Fridays. Confessions for First Fridays must be made by appointment. Confessions for the Eve of Holydays of Obligation will still be available, but only if that Feast is a Holyday of Obligation that year. One hand is placed upon the other (do not hold hands side by side). The placement of your hands one upon the other is a symbol of a throne. When the host is placed on your hand you bring the lower hand up and pick up the host to place in your mouth. An Instructional Video provided by the Archdiocese of Portland in Oregon. Can I receive communion at a non-Catholic church? To avoid confusion, please understand the following. No Catholic should receive the communion of a church other than a Catholic church. While we share a great deal with other Christians, their belief in the Eucharist is not the same, nor is it in union with, the beliefs of the Catholic Faith in regard to the reality of the Eucharistic Presence of our Lord Jesus Christ. The Eucharist makes Jesus truly present–really here–in the consecrated Host and Precious Blood. St. David’s Choir rehearsal is on Sunday morning at 10:00 in the Upper Room. The choir sings at the 11:30 Mass following rehearsal. The choir is always looking for new members. You do not need to know how to read music, but must be able to sing on pitch. High school students are welcome.